This software will give you the possibility to do different things (both in live markets and in strategy tester). Close all profitable buy orders. Close all profitable sell orders. Numerical value of the average volatility chosen in the inputs section. Numerical value of the average volatility chosen, based on the percentage chosen in the inputs section. Set a buy stop grid. 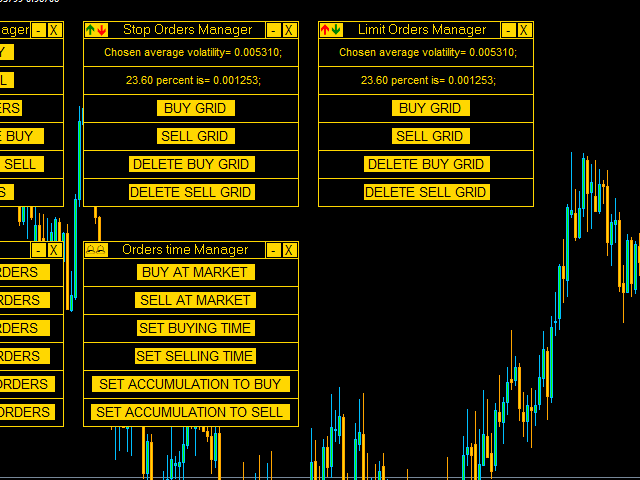 Set a sell stop grid. Delete the buy stop grid. Delete the sell stop grid. Set a buy limit grid. Set a sell limit grid. Delete the buy limit grid. Delete the sell limit grid. Set take profit for buy orders in points. Set take profit for sell orders in points. Set stop loss for buy orders in points. Set stop loss for sell orders in points. Set trailing stop for buy orders in points. 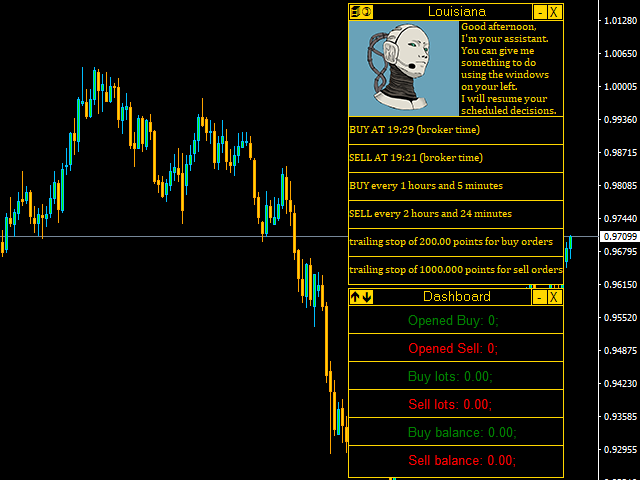 Set trailing stop for sell orders in points. Schedule a buy at a certain time (Hour and minute). Schedule a sell at a certain time (Hour and minute). Buy now at market and choose a time interval at which buy again. Once activated, button will change to allow you to stop accumulation. Sell now at market and choose a time interval at which sell again. Once activated, button will change to allow you to stop accumulation. Other than this, you'll have at your disposal two other panels on your right. Starting from above you can find your personal assistant (screenshot 2), she will resume your scheduled decisions. You've scheduled a buy operation. You've scheduled a sell operation. Your set a buy accumulation. Your set a sell accumulation. Your set trailing stop for buy orders. 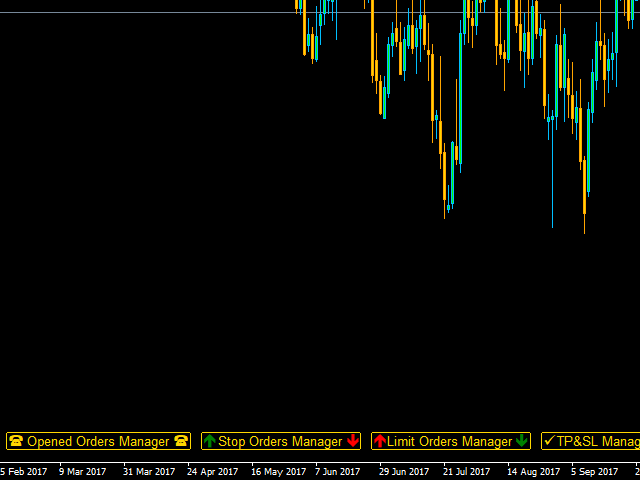 Your set trailing stop for sell orders. Number of opened buy orders. Number of opened sell orders. Each panel can be iconified on chart bottom or closed. LOTS FOR TIME ORDERS: Set lots for Orders time Manager panel. BUY COLOR: Set your favourite color for buy orders. SELL COLOR: Set your favourite color for sell orders. 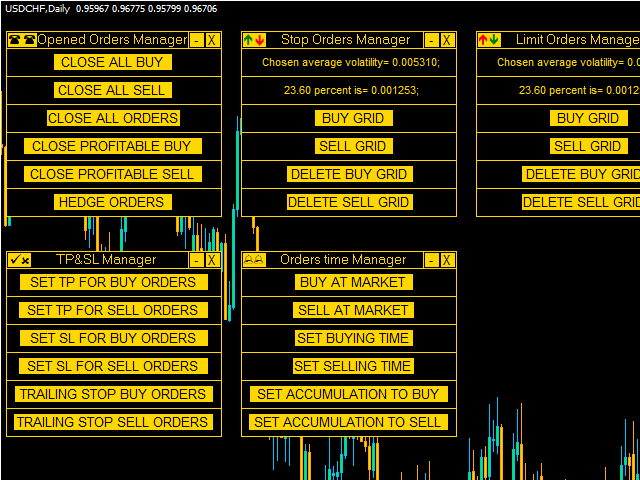 LOTS FOR PENDING ORDERS: Set lots for grid orders. AVERAGE VOLATILITY BARS: Set average period. AVERAGE VOLATILITY TIME: Set average volatility timeframe. % FOR STOP & LIMIT ORDERS: Choose average volatility percentage to set the distance between grid orders (both limit and stop orders). PENDING ORDERS NUMBER: Number of pending orders that the EA will put on the market when you set a grid. FRONT COLOR: Set front color.